Boston, MA – SeaAhead and the Cambridge Innovation Center (CIC) announced today their partnership to open the first dedicated Bluetech Innovation Hub in Boston. The SeaAhead Hub, located at CIC Boston (50 Milk Street), will enable ocean entrepreneurs, growing businesses, investors and corporations — as well as non-profits, the public sector and researchers — to have a central co-working and convening location. The SeaAhead team believes that Boston is the ideal location for bringing together the Northeast’s broad ocean capabilities with the region’s vibrant tech and venture ecosystems. Bluetech refers to technology-based innovation tied to ocean sustainability in areas such as ports and shipping, fisheries, aquaculture and offshore renewables. The bluetech mandate also includes coastal resiliency, ocean-centric approaches to climate change, plastic pollution and the impacts of stormwater and agricultural runoff. SeaAhead was founded in 2018 as a benefit corporation to catalyze new bluetech venture formation and success. “Through the Hub, we will look to catalyze new solutions by connecting disparate stakeholders, including venture investors and corporations that are seeking to better engage with urban innovation districts. The Hub will also act as a US landing spot for bluetech stakeholders from other international centers of excellence, such as Europe,” said Mark Huang, Co-Founder and Managing Director of SeaAhead. 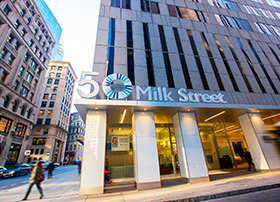 SeaAhead will launch within CIC’s Boston location at 50 Milk Street, in the heart of CIC’s thriving innovation community. With 20 years of experience, CIC has a mission to create powerful innovation communities for exceptional entrepreneurs who fix the world. SeaAhead is a benefit corporation with the mission of supporting new venture development at the intersection of innovation + sustainability + the oceans. Our ecosystem includes technologists, scientists, startups, corporations, governments and other ocean stakeholders that are coming together to create impact in areas including greener shipping and ports, aquaculture and fishery processes, offshore alternative energy and smart cities. SeaAhead is working to improve bluetech startup success rates through connections to investors and customers, mentorship and promotion. More information at http://www.sea-ahead.com or on Twitter @SeaAhead. Cambridge Innovation Center (www.cic.com) is a leading builder and operator of innovation communities. CIC has approximately 1.5 million square feet (140,000 m2) open and in development, and has served over 5,000 startup and technology companies, including Hubspot, Uber, Pandora, Square, Google/Android, Apple, Facebook, and Amazon. Over $7B of venture capital is headquartered within CIC’s buildings, putting it on par with many countries, and at least $10B has been invested in companies that got started at CIC. CIC has built innovation communities in Cambridge, Boston, St. Louis, Miami, Philadelphia and Rotterdam (Netherlands), and has communities under development in many more cities, including in Warsaw, Poland and Tokyo, Japan. CIC has won numerous awards, including Boston Magazine’s award for “Best Place to Work”.